Care2 Causes | What Is the Boeing 737 Max 8 and Should I Be Worried? What Is the Boeing 737 Max 8 and Should I Be Worried? In the aftermath of two major plane crashes in five months, the Boeing 737 Max 8 is in the headlines. And many passengers — especially those with upcoming flights — have some questions about this aircraft. First things first: You’ve probably heard that the entire fleet of Max 8s is grounded worldwide, though the U.S. was a holdout as numerous nations took aggressive action. U.S. Transportation Secretary Elaine Chao even took a flight on a Max 8 as federal officials tried to assuage fears. The Federal Aviation Administration initially insisted that its review of the aircraft had revealed no safety concerns but later changed its tune. This means if you have an upcoming flight, you’re safe. None of these planes is in current use, and Boeing has affirmed that it supports the decision to temporarily take them out of service. The company has also grounded the related Max 9. The planes cannot be put back in service without regulatory approval and sign-off from Boeing. And if all this talk of plane crashes is making you feel generally nervous, accidents involving commercial jets are extremely rare given how many are in the air at any given time. They just get outsized news coverage. Most aviation incidents occur with small private aircraft, and you’re statistically much safer flying than driving or walking down the street. So what did happen with the Max 8? And what’s going to happen now? This narrow-body aircraft seats 200 people in its basic configuration and was designed for fuel economy and increased room for passengers. While Boeing has received over 5,000 orders from airlines around the world, it’s only delivered about 350 so far, which is pretty standard: The company nails down contracts years in advance — given the size and complexity of aircraft, the need for custom fitting and the price tag, which is north of a hundred million dollars. Boeing also boasts that the plane is quieter, a concern for some passengers who prefer not to be buffeted by the noise of jet engines in flight. The first aircraft entered service in 2017. Prior to the Lion Air and Ethiopian Airlines crashes, pilots had raised safety concerns about this aircraft and said there were problems with a flight control system used to stabilize the plane. The Ethiopian Airlines flight reported a problem with a flight control system shortly before the crash. It should be noted that the causes of both crashes are still under investigation; it may have everything to do with the Max 8, nothing to do with it or something in between. 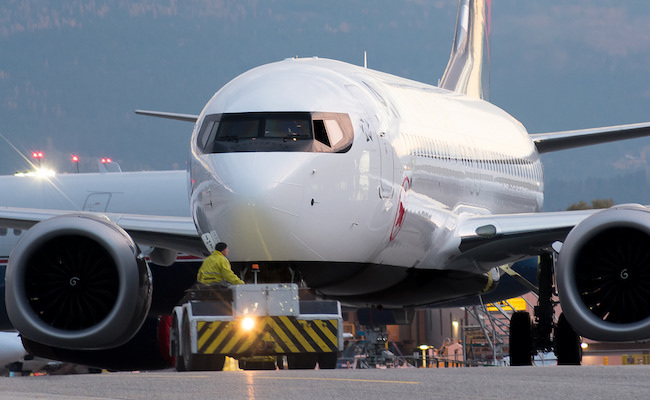 Boeing, airlines with Max 8s in their fleets and regulatory authorities are working together to learn more about the crashes and whether updates to the Max 8 could improve safety. Why did the U.S. take so long to join the rest of the world on this one? Well, it’s notable that the FAA’s top three administrators are all acting officials who have not been subject to Senate confirmation, a widespread issue across the Trump administration. The American people, via the Senate, have not had an opportunity to evaluate the experiences, qualifications and background of these officials to determine whether they are an appropriate fit to lead the agency. Dan Elwell, the acting administrator, has extensive experience with the airline industry and its affiliated lobbying groups, while Carl Burleson, the deputy acting administrator, is a career FAA employee. As for the future of the Max 8, that’s, uh, up in the air pending the outcome of investigations. Boeing has invested a lot in the Max line of aircraft, and airlines are unlikely to want to flush hundreds of millions of dollars down the toilet if they can avoid it. It may be necessary to overhaul some components to address safety concerns — and the name Max 8 may become tainted thanks to this very public drama. In the meantime, if you ever want to find out what kind of plane you’re flying in — whether you want to score the best seats or you’re just curious — you can check with the airline. (Many include this information in their apps.) Be aware that airlines can swap out aircraft on short notice, so if you have specific concerns, ask gate agents before boarding. But remember that despite all the hullabaloo, commercial aviation remains extremely safe — and not great for the environment, making this a prime time to think about taking the train more often. Since those planes are out of service, it's safe. I want to know more about the corrections that will be made to feel safe flying. Once they will be used again, they should offer republicans free flights to test them out. I have thrown away my boarding pass & deleted my emails related to my flights last month on Southwest Airlines, not imagining I would want to see them again, but just as a matter of curiosity, I would like to see if my homebound flight was on the Max 8. Toward the end of the flight, the captain announced upcoming turbulence. I have been on airplanes that hit turbulence in the past, but not like this one. This is the first time I really thought the plane might crash.